Cross-posted from American Creation. Reprinted here lest I be accused of being soft on New England's cherished mythologies. I wanted to follow up on Lindsey's interesting post regarding the place of Plymouth in American memory. In the video she posted, the commentators are sitting in front of the impressive monument known as the National Monument to the Forefathers (photo via Wikipedia). This memorial, which historian James O'Gorman called, "one of the more lugubrious deposits of mid-nineteenth-century American ideals," was erected by the Pilgrim Society in the 1880s (planning began in the 1850s, but things got off track during the Civil War). The monument features a 36-foot tall granite colossus titled, Faith, surrounded by smaller (15-foot) allegorical statues depicting Liberty, Education, Law, and Morality, as well as several relief panels. This statue is important because it reminds us that much of what we "know" about the Plymouth colonists and their role in founding the country comes from 19th-century efforts to recapture a usable past, not from rigorous historical investigations into the early 17th century. In the mid 19th century, New Englanders were busy fighting a sectional conflict for supremacy over the meaning of America, and one of the best weapons they had in their arsenal was the argument that the Pilgrims founded America on Christian principles. By ignoring those sordid mercenaries in Jamestown and exalting the Pilgrims as beacons of both religious piety and democracy, they strengthened their claim to the legacy of the forefathers, at the same time denying the legitimacy of Southern claims that the spirit of '76 lived on in the South. This statue is a concrete (granite, actually ;)) expression of 19th-century interpretations of 17th-century history. Imagine what a monumental history of New England would have looked like if authored by Harriet Beecher Stowe. This is it. The Victorian interpretation of 17th-century American history is still very much with us (it's even on the citizenship exam). I'll bet the average American "knows" 10x more about Plymouth than about any other 17th-century colony and thinks that the Pilgrims profoundly influenced our nation's democratic and religious institutions when they did nothing of the sort. The Mayflower Compact was not a principled clarion call to democracy. The Pilgrims were not big fans of religious toleration (as the intro video at Plimoth Plantation helpfully points out) and held no appreciable influence over any of their contemporaries, they didn't even influence Massachusetts' Congregational practices. Christianity was a major factor in English colonization, but not in the way 19th-c New Englanders thought. 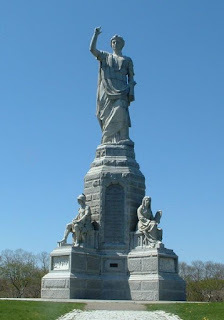 For more on this monument, I recommend O'Gorman's "The Colossus of Plymouth," in The Journal of the Society of Architectural Historians (1995) and James Deetz' The Times of Their Lives: Life, Love, and Death in Plymouth Colony (2000).